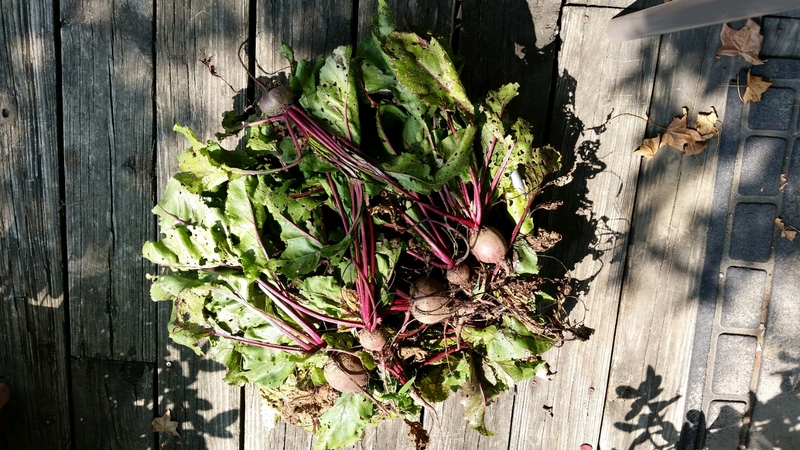 Pulled the rest of the beets and they are waiting for me out on the deck so that I can relieve them of their stems and bring them in the house to be bathed. Extracted a basil that had long gone to seed and discovered a small volunteer tomato producing some lovely little yellow orbs of sweetness. Cut the kale and tossed away all that have been damaged by the Cabbage moths and still ended up with a huge sack. This is day 3 of my second Med cut. I am dropping once again by .5 mg. Having some odd pains and muscle spasms this time around. So far emotions remain stable and hey I was able to get out in the garden and do a little work so the tiredness isn't overcoming me totally. If this goes by the same pattern as last time I cut, after a couple of weeks of weird symptoms I should be doing okay. Things I don't like about withdrawal are the increase in heart palpitations and the burning in my tongue. But I know what's causing them so I am able to let go of the anxiety and truly that's what's so crippling. The morning was brightened by a amazingly amusing and heartwarming conversation with an online friend. The morning was dimmed but just a little, by a conversation with my daughter who is going through a messy time in her life and is finding difficulty in seeing the value in herself. Gosh, it hurts me when my children cry and I can't do anything but listen and relay information about what I know from experience. It's good that I read all that stuff on Detachment just yesterday as it stood me in good stead so instead of falling down her rabbit hole I was able on to stand on the edge and call down words of encouragement. And that's about it from Shady Grove Farm. It's a cool day today so the beans that just kept on giving may finally get pulled up as they are showing the signs of their age no, longer blooming, and producing deformed beans. Makes me think of Harold and Maude and her little talk on the cycle of life. What an amazing coincidence! I too had an amazingly amusing and heartwarming conversation with an online friend earlier today! Surely we must be two of the luckiest people on the internet, lol! Sorry to hear of your daughter's difficulties but feel better knowing that she has her mom to talk to. Which, I've gotta think, is some more of that good luck that you and I had. Wow L, that is weird, we really are lucky. It was a great day, the sunlight on my face and the stars in my eyes, yep.